Dom Pérignon: the best wine in the world. Dom Pérignon: The most powerful of all champagne brands. Released only as a vintage, Dom Pérignon is cellar-aged for at least seven years prior to release. This time is critical for harmonising the flavours and ensuring that the wine’s balance remains elegant, sensual and ethereal. Dom Pérignon can also be enjoyed many years later with rare OEnothèque vintages, released by the Chef de Cave at times when the intensity and complexity of the wine has reached optimum levels. 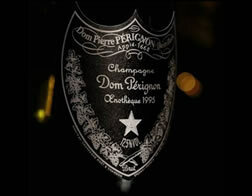 Single bottles of Dom Perignon Vintage 2000 (75 cl) are available as well.